For observers who prefer to be mobile, video files can be downloaded directly on a device. The downloadable audio recording includes the conversation of all participants. There’s some richness in the conversation. A digest with some timecodes may help a listener to jump to a key point. Generating from the design into the world? [28:40 Negotiated Order With … HF] Timeless Way of Building and A Pattern Language, one as the theory and the other as the practice, conveying the same thing? [31m30 … HF]: In creating order of, you’re in the structure, and in “negotiating order with”, you’re in the processes. Problem with systems theory: which comes first, structure or process? CK: Alexander says the pattern language is the gate, and there’s a way to go through the pattern language. [43m30 on Six General Elements … HF]: General systems and the pursuits of isomorphies (working across all types of systems, biology, ecology, etc.). Non-material world: does medicine rely more on the kit of parts, or on the process? [1h01m40s: HF]: Creating order of, as more goal-directed? As a consultant, would come in without patterns creating in advance What is the nature of order? What is creating order of, … and ? [1h11m10s on A Straw Man … Metaphors]: CK: Timeless way as method? A timeless way of building (for Indonesians)? Universal? Checking understanding: Alexander uses “A Pattern Language”, and then “The Timeless Way of Building”? Max Jacobson said it’s all about beauty: Visiting Eishin Campus, was it beautiful? Pause in responding to answer: wow, if Alexander did all this work, and you didn’t find it beautiful? Could be a third column: ontological design, from a language-action perspective? Christopher Alexander at OOPSLA, you’re not using your code to change the world for the better? One of the findings from the workshop was that participants had not yet read Christopher Alexander’s 2012 book, The Battle for the Life and Beauty of the Earth: A Struggle Between Two World-Systems, that I have recommended as the best publication to start. Alexander documented as a scientist, and thus captured his position at each point in time, leading to changes in vocabulary. 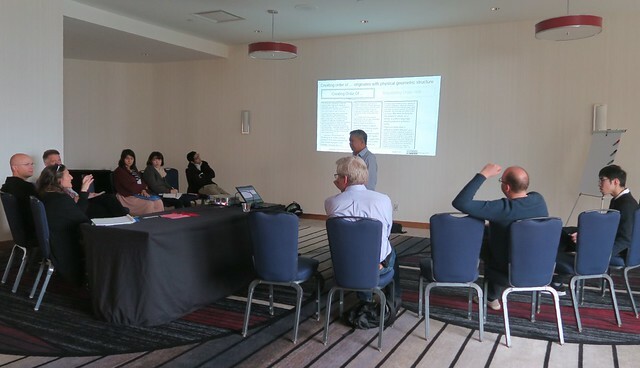 Workshop attendees agreed that the Alexander’s final publication could be used a the last word on his thinking, and said they might prepare for next year’s meeting by reading it. For the proceedings, a formal revision of the outline was written as a reflection piece, summarizing the richer audio recordings available digitally.